Head of Policy Department of the Center for People and Nature (PanNature) Nguyen Thi Hai Van pointed out a loss of protection forest is the culprit of much flash flood and erosion lately. At a meeting jointly-organized yesterday by PanNature, a Vietnamese not-for-profit organization dedicated to protecting and conserving diversity of life and improving human well-being in Vietnam, and the Department of Special Use Forest and Protection Forest Management under the Ministry of Agriculture and Rural Development discussed measures how to protect and restore protection forest in the country in a bid to prevent catastrophic flood. Forests can retain excess rainwater, prevent extreme run-offs and reduce the damage from flooding. They can also help mitigate the effects of droughts. Accordingly, Vietnam plans to raise the amount of protection forest to 5.68 million ha by 2020 with 93 percent of protection forest, citing the country’s forestry development strategy. 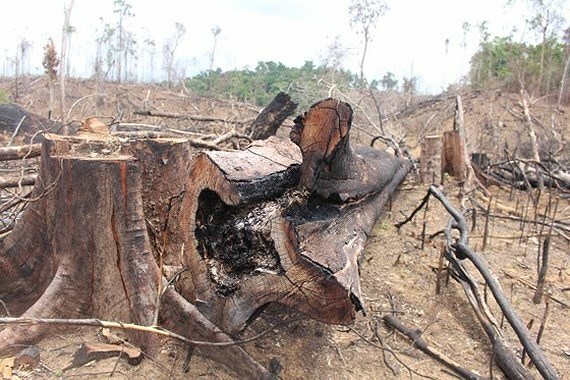 However, in reality, people are destroying drastically protection forest in localities in northwest, central highlands and south-central Vietnam; the size of the country’s protection forest is in fact decreasing at an alarm level. Loss of forest is the culprit for devastating flood for recent years. Vietnam lost 1.7 million hectare of protection forest from 2004 to 2014 of which 1.43 million hectare of natural forest disappearing in the country. Worse, the Ministry of Agriculture and Rural development also submitted project of agriculture re-structuring by transferring 1.2 million hectare of forest and protected forest land for producing combined with growing forests. As per PanNature’s announcement at the meeting, 1.288 million hectare of protection forest are managed by commune people’s committees which neglected management resulting in huge losses of protection forests.